Sixteen-year-old Lars lives with his father Henrik in a small village in the Uckermark, one of the loneliest parts of the country, having moved there from Berlin after his parents separated. The locals ignore them to the extent that nobody even comes to their Christmas party. Lars’ life suddenly improves when he meets the deaf, eighteen-year-old Marie. But then his Aunt Jana arrives and it’s clear she and his father are having a relationship and she’s planning to stay. Lars seeks refuge with Marie who shows him her world and that it’s possible to say a great deal without words. But her father is unhappy at the teenagers’ relationship, fearing he’ll lose his daughter. The festive season takes a turn for the worse when Lars’ mother, complete with her new and much younger boyfriend turns up. Christmas becomes a disaster as the retreat to the countryside turns into the battlefield for a family that has never learned to talk with each other. Lars seeks refuge with Marie and enjoys the happiest Christmas of his life. But fate hasn’t finished with them. 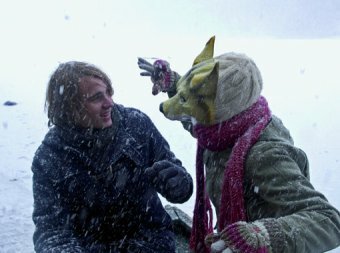 Jagdhunde marks the feature debut of Ann-Kristin Reyels, who studied at Potsdam-Babelsberg’s renowned “Konrad Wolf” film school. Her short film, dim, featured in German Films’ NEXT GENERATION 2005 program. For those of you who remember their Latin, the root of credofilm’s name says it all. For those who don’t, credo means “I believe” and there is a fundamental faith underlying its activities. Among credofilm’s previous credits are Mirko Borscht’s Kombat Sechzehn (nominated for the First Steps Award 2005) and several productions for Germany’s public broadcasters, including for the renowned ZDF Das kleine Fernsehspiel.